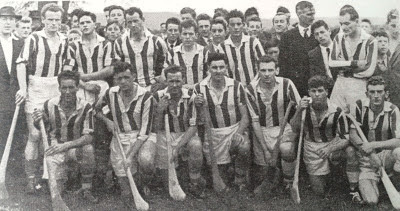 Back Row (L to R): P. Langan (hat), J. O'Dea (background), L. Fraher, T. Mansfield, A. McGovern (background), P. Beatty (behind A. McGovern), J. Cashin, T. Landers (background), D. Russell, F. Condon (background), T. Hogan, J. Elsted (background), N. Kelly (background), T. Treacy (behind N. Kelly), N. Browne (in front of N. Kelly), J. McGregor, J.A. Murphy, D. Enright, J. (Cush) Duggan, P. Clancy, M. Ahearne (cap, barely visible). 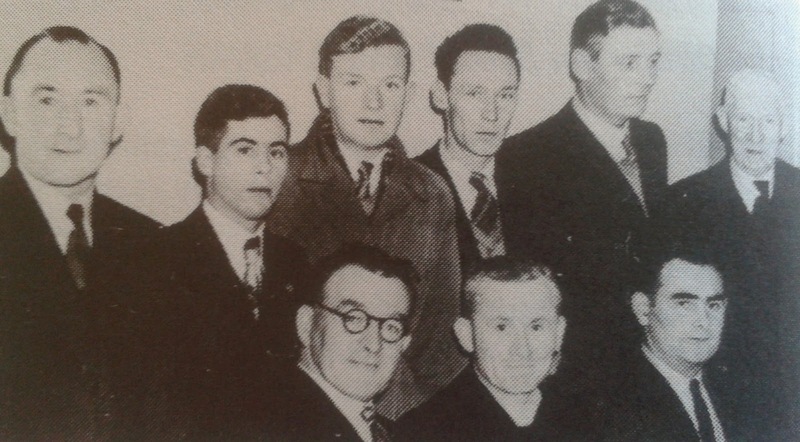 Front Row (L to R): N. McGovern, L. O'Dea, G. Flynn, D. Whelan, A. Flynn, J. Hogan, B. Curran. Absent from Picture: D. O'Connor. 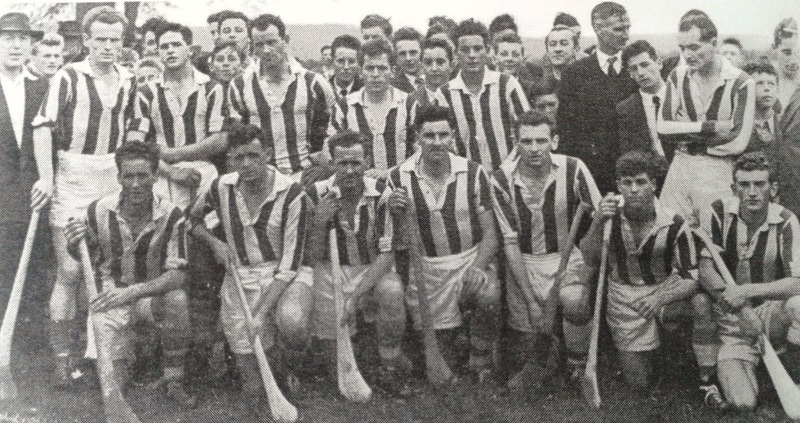 This week's photo shows the Abbeyside Senior Hurling team that played Erin's Own in the County Senior Hurling Championship Semi Final at Fraher Field in October 1957. Due to a clash of colours, the Village men had to don the Ballinacourty jerseys. Undeterred, they emerged victorious in a tight game, 4-7 to 4-3 to set up a County Final meeting with Mount Sion. Our popular Jack the Joker Fundraiser will continue this Sunday night in Kennedy’s Live where the Jackpot will be €2000 as on Sunday night Kevin Fitzgerald was drawn out of the drum and turned card number 41 which was the Joker, while Tom Walsh and Switchie O’Donnell won €25. We played Passage in the County League on Sunday last in Abbeyside and recorded a win over a very understrength Passage side. We have now qualified for the semi final of the County League/ Sargent Cup. This Thursday evening we play Sliabh gCua in Fraher Field at 7:30pm. Our Bingo continues this Sunday night in the CBS Hall where the jackpot is €950. This Wednesday Liam O’Neill, President of the Association will visit our club where he will view the development work which has taken place to date as well as looking at our plans for future development. After this he will present the playing gear to our Under 14 Feile panel who travel to Derry on Thursday morning for the first of two hectic weekends. All are welcome to come along to the club grounds on Wednesday evening at 5:15pm to meet the President and help give him a warm welcome. This month’s Déise Draw takes place in Minnies Bar at 9pm this Friday night, where all are welcome to attend. What a busy 4 weeks for our U8 panel. They've completed the West County Play and Stay go games blitzes in which they played 2 weeks of hurling and 2 weeks of football with Modeligo the venue for the four Monday nights. Also the U8 football tournament on Wednesday saw the boys heading to Ballinameela, Clashmore and a trip to Affane still to come on the final night. Throw into the mix a hurling tournament in Ballyduff Lower against De La Salle, Mount Sion and Ballyduff and Saturday last June 22nd we were invited to the Bishopstown (Cork) hurling tournament where we took on teams from Cork and Tipperary. In all games the lads have acquitted themselves brilliantly and as each game is played the improvement is noticeable and the experience invaluable. A big thanks to all parents for bringing the lads along every night, to all clubs who hosted and invited us but I'd like to send a special thanks to Bishopstown for inviting us, the friendly welcome, and 'party' for the boys afterwards. It's always nice to visit other counties and represent our club and county. A limited number of seats are available on the bus to Derry for the Féile football competition. If you wish to go on this bus please contact Carmel Power on (087)2598923, as soon as possible because spaces are limited. Féile Peil takes place in Derry this weekend and everyone in the club wishes everyone involved the very best of luck. The president of the GAA Liam O’Neill will visit our club this Wednesday night to present gear and bags to this group of players and he will also see some of our stars of the future in action as some groups of players will be getting coached on the night in conjunction with his visit. We would like to congratulate our own Daithi Brunnock on being selected to represent Cork in the Primary Game exhibition game on Sunday last at half time in the Cork/Clare Munster Semi Final. This is a fantastic honour for Daithi, and it is certainly a rare occurrence for Cork to select a Waterford player on a Cork team which shows that Daithi must certainly have stood out at the selection trial. Back Row (L to R): J. Goode, J. Hogan, A. Foley, D. Terry, D. Hanrahan, J.B. Daly. Front Row (L to R): J. Power, Fr. M. Walsh, CC, M. Fives. This week's photo shows many club personalities of yesteryear at a Ballinacourty Club Social in the early 1950s. The President of the GAA, Liam O'Neill, will visit our Club Grounds on Wednesday next, June 26th to present our Féile hurlers and footballers with their gear before they set off for Derry and Limerick. Here on successive weekends they will represent Waterford in these prestigious national competitions. It is a great honour for our club to host Uachtarán Chumann Lúthcleas Gael and we invite all members, players, parents and officials to come along and join in the festivities. The event is scheduled to begin at 5:15pm. Our popular Jack the Joker Fundraiser will continue this Sunday night in Kennedy’s Live where the Jackpot will be €13,300 as on Sunday night Eugene Hickey was drawn out of the drum but did not find the Joker, however he did win €50, while Stan Cummins and Dec Hayes won €25. The following are the numbers that haven’t been turned yet 3, 11, 18, 30, 41, 44, 45, 47, 48, 49, 50, 51, 52. We play Passage in the County League this Sunday at 3pm in Abbeyside. On Sunday last we took on The Nire in our third game in the Western Championship, which was played in very wet and windy conditions. Unfortunately at the end of the game we were narrowly defeated. TEAM: R. RYAN, D. DEE, J. MOORE, S. O’CONNOR, J. RYAN, T. HANRAHAN, C. HICKEY, L. HURNEY, M. LAVAN, S. CROTTY, E. ENRIGHT, L. MULHEARNE, D. POWER, J. POWER, D. FERNCOMBE. SUBS: S. KEARNEY, N. DEE, D. HICKEY, J. FOLEY. Our Bingo continues this Sunday night in the CBS Hall where the jackpot is €900. On behalf of all in the club we would like to send our sympathies to the family and many friends of the late Patrick Spratt, who passed away in London recently after a brave battle against illness. The Spratt family has been involved in the GAA for many years and Patrick played at underage and adult level for the club winning a number of County Titles during his playing career. Once again we send our sympathies to all of Patrick’s family and friends on their sad loss. A limited number of seats are available on the bus to Derry for the Féile football competition. If you wish to go on this bus please contact Carmel Power on (087) 2598923 as soon as possible because spaces are limited. We played the Brickey’s in the Western semi final of the minor football championship in Fraher Field last week and after a poor performance defeat was our lot. In these notes last week I stated that we had qualified for the western final but this was a mistake on my part and I send my apologies to anyone concerned. Training will start for the minor hurlers after the exams. Preparations are well under way for the under 14 hurling and football Feile campaigns in Derry (football) and Limerick (hurling) respectively. These will hopefully be events that all the players can look back at with fond memories when they get older. This group also have a county hurling semi final to play this week and best wishes from everyone in the club go to the players and mentors involved. Training continues every Friday evenings from 6:30 to 7:30 for U5s up. U-8 Grainne Moore, Megan Foley, Ciara Barrett, Anna Noctor, Meabh Kiely, Rhiann Flynn, Laura Murray, Aoibheann Murray, Elizabeth Spratt. U-10 Robyn Lenihan, Cliodhna Roche, Emma Reynolds, Lauren Gough, Caoimhe Ni Mhurchu, Grace Tritschler, Heather Reilly, Kaia McGovern, Laura Morrissey, Hannah Walsh, Lauren Maher, Ellie Daly, Caoimhe Horgan, Clodagh McDermott. Our Under 12s play their next league match on Thursday 20th away to An Rinn. Meet at Abbeyside grounds 6.15pm. This is the league table after the third round of games in Ballinacourty’s County Senior Football Championship Group. 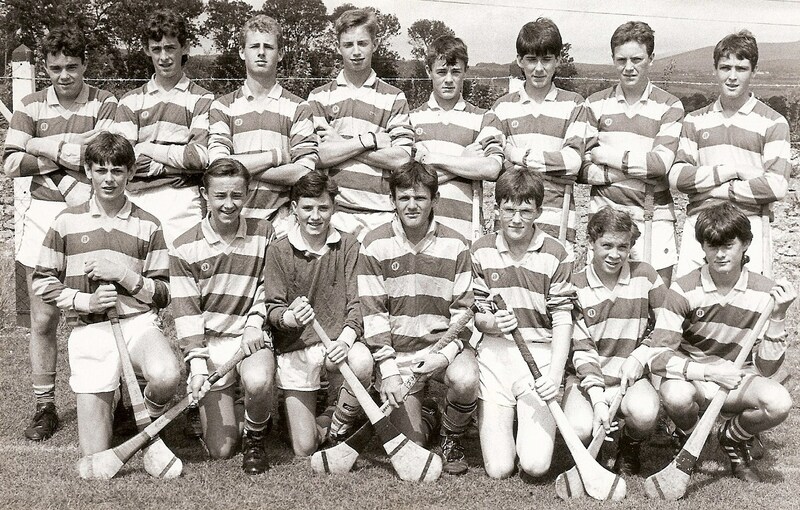 Back Row (L to R): Brian Beatty, Damien Cliffe, Dermot Ryan, Patrick Veale, Eoin Murray, John Clancy, Dermot Walsh, Johnny Shields. Front Row (L to R): Dwaine Moore, Michael Enright, Brendan Landers, Jimmy Stacey, Gavin Breen, Kieran Cunningham, Alan Landers. This week's photo shows the Abbeyside U16 hurling team that won the County 'B' title at Fraher Field in 1990. Our popular Jack the Joker Fundraiser will continue this Sunday night in Kennedy’s Live where the Jackpot will be €13,002 as on Sunday night Carmel Power was drawn out of the drum but did not find the Joker, however she did win €50, while John Keane and Breda Egan won €25. The following are the numbers that haven’t been turned yet 3, 11, 18, 30, 40, 41, 44, 45, 47, 48, 49, 50, 51, 52. On Saturday evening last we played Ballygunner in the County Championship in Walsh Park and recorded a very good win. TEAM: S. ENRIGHT, J. POWER, S. O’HARE, E. COLLNS, J. HURNEY, J. GORMAN, C. HICKEY, D. COLLINS, R. FOLEY, T. HANRAHAN, G. HURNEY, M. FIVES, M. GORMAN, P. HURNEY, M. FRENCOMBE. SUBS: M. O’HALLORAN, S. O’DONOVAN, E. ENRIGHT, S. CROTTY. We played Clashmore/Kinsalebeg in the Western Championship on Sunday last and despite an improved performance by the team we were defeated 1-15 to 0-08. TEAM: L. POWER, P. COLLINS, J. MOORE, S. O’CONNOR, E. BERGIN, P. LYNCH, J. DUGGAN, C. MOLONEY, J. O’MAHONY, N. DEE, L. HURNEY, D. HICKEY, E. CROTTY, J. O’BRIEN, T. MURRAY. SUBS: J. FOLEY, D. SWEENEY, T. McGRATH. Our Junior hurling team recorded their second win in the Western Championship on Friday night last thanks to very good display against Ballysaggart in Bushy Park. TEAM: J.P. McGRATH, S. CLIFFE, P. BREEN, J. WALSH, D. FERNCOMBE, L. BERESFORD, C. ENRIGHT, B. WALSH, B. HENLEY, E. YOUNG, R. RYAN, S. FLYNN, K. KELLEHER, I. KIELY, G. FLYNN. SUBS: M. RAHER, S. KEARNEY, P. BERGIN, A. O’RAGHNAIGH, G. MORRISSEY. Our Bingo continues this Sunday night and please note that it will be in The Park Hotel this week, where the jackpot is €850. We would like to express our thanks to Sharon Kiely and Michelle Treen for their work organising a cake sale last Sunday morning in both Ballinroad and Abbeyside masses. We would also like to thank the parents that both helped at the masses and baked the lovely array of food, well done. 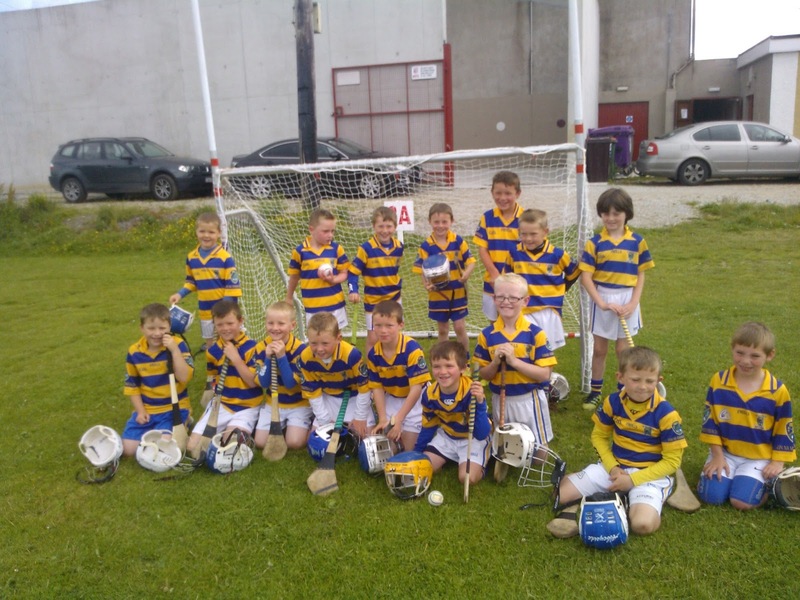 We played the final game of the Under 12 Town and Country Hurling League last Friday evening. Great to see all of our players back. This was a great game with our boys playing some of the best hurling they have played this year, and came out on top. There are a number of games planned in the coming weeks for this age group. It is important that you come to as many training sessions as possible. Our Division 1 team played their final game of the league part of the county championship. This was against De Le Salle. This game was always going to be a very close game based on our last encounter in the Féile final where we won by a point. This time around there was again one score between us where the city team got a goal in the last few minutes to win by that margin. We have now qualified for the semi finals of this championship where hopefully the finishing position will be decided this week. Our second team played An Gaeltacht in Old Parish last week. Our lads played well but could not match the very strong opposition. The final score 6 – 8 to 2 – 6. There are still 3 games left to the league part of this championship. A big word of congratulations must go out to our under 10 hurling team who last Saturday week won the prestigious Ballyduff tournament. A great day out was had by everyone involved and a special word of thanks must go to the mentors involved. Hopefully in years to come these young lads will be the future of our club. Our minor football team had a good win over Stradbally in the western semi final last week. We now qualify for the western final which will be played after the exams. Minor hurling will also commence after the exams. On behalf of the club we would like to send best wishes to all those in the club who are presently sitting exams. Outdoor hurling continues every Saturday morning from 10.30 for boys aged five and up. Helmets and hurleys can be purchased through the club at a discounted price.